Huge, 6bd/7ba historical church renovation where gorgeous eclectic design meets modern comfort. Tastefully decorated and situated in the historic Whittier neighborhood, this converted 100-year-old, mission-style church is ideal for groups and centrally-located near RiNo, Five Points and the City Center. Amplifying all the Mile High City has to offer, you'll stay in luxury and leave divinely inspired. This is your opportunity to stay in one of the region's most unique, spacious and artistically-designed accommodations. Your home will be a piece of Denver history. Meticulously renovated in 2017, the space retains the charm and select architectural elements of the original structure while taking on a whole new vibe. Boasting six private ensuites (two upstairs, four downstairs, each uniquely-themed) and a sprawling main floor with designer kitchen, the space is perfect for large groups. 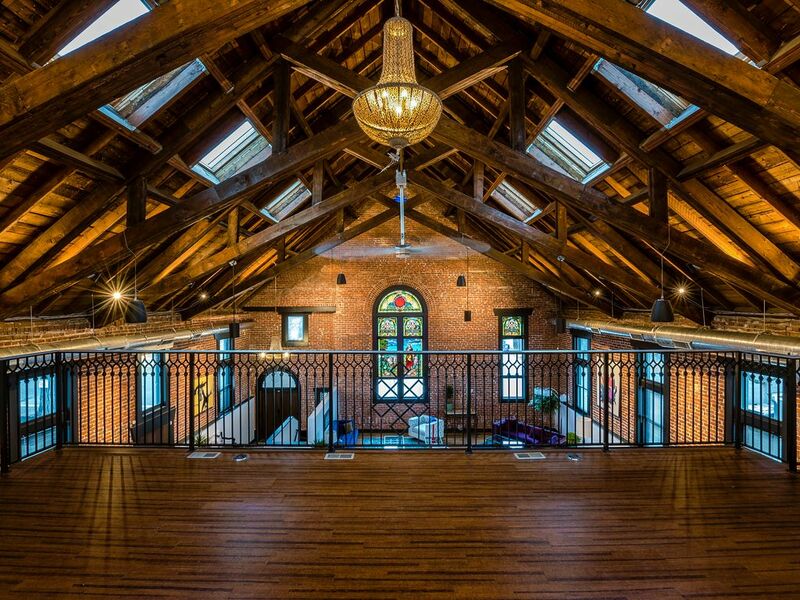 The magic doesn't stop there: upstairs, you'll find a 550sqft loft lounge--perfect for breakout gatherings, making a grand entrance to the main floor or just hanging out. The outdoor space is perfect for entertaining, replete with in-line fire pit and custom seating. Downstairs, the vintage Rec room, furnished in classic mid-century modern/atomic furniture, features a full wet bar and provides a great space for gathering as well as access to the four lower suites. Throughout, you'll be delighted by the eclectic style, unique art and bohemian, middle eastern-inspired decor. The space is purpose-built for guest enjoyment and full of thoughtful details including an iPad-controlled home automation system that integrates lighting, audio and security throughout the property. Ultimate respect of the space, decor and neighborhood is essential. While cannabis-friendly, tobacco use is prohibited on the property outdoors. Think inspirational launchpad for adventures, not a place to rage. You'll have exclusive access to the entire space including guest suites, main floor, lofted lounge, downstairs rec room and outdoor yard/gathering space. There are four spots on the lot and two more on a gated driveway for loading or storing two more vehicles. Ample street parking as well. Please mind street sweeping and other parking restrictions! We really enjoyed our quick stay. The host was very responsive and did a fantastic job at accommodating our requests. Such a cool place in a great city! All the rooms were great and overall stay was perfect. We had a company work event here with about 12 people and it worked out great. Super cool spot with a lot of personality! The projector in the main area was very convent to teach on and the technology top of the line. Our host was great! He promptly helped fix a fire alarm, that was very high up and needed a new battery, in the evening. I wanted to serve doughnuts in the basement (a church memory as a kid) so I went and got voodoo doughnuts which is close. We actually ate them upstairs but they were delightful. Along with Illegal Petes catering, which is also close to the location, we had a successful event. Thank you for the hospitality. This place is a literal treasure! Owner was beyond responsive and accommodating. Can't recommend it enough! Not only was the property out of this world cool, but Alex also made sure our stay was amazing. My company held a four-day class at this property with 20+ people and it was perfect. Some of us stayed in the six bedrooms while the others came for the class during the day. It's a great location for an event of just about any kind. This renovated church is incredible! Tech savvy, modern, lots of space, the photos don't do it justice! Close to RiNo (the art, food, trendy district of Denver). The owner is great to work with and extremely responsive! Great for groups, who want to lay low or go out and enjoy the city. This is the only property you should book with a group of 10 or more. Thanks, Scott! We really enjoyed hosting your group. See you soon!